Consideration of the values in Table 3-2 and of the graphs of figs. 3-28 and 3-29 indicate that a piston weight of 2.0 pounds is a reasonable choice. This choice is based on the same factors explained previously in the analysis of gas operation. Having determined the desired piston weight (2.0 pounds) and velocity (91.7 feet per second), the gas mechanism must be designed to produce this velocity. 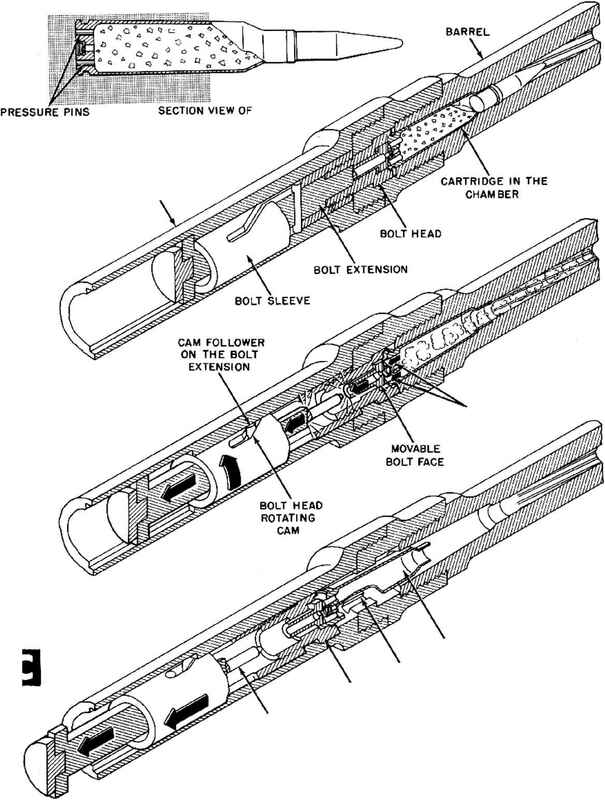 'ITie design process consists essentially of determining the location of the gas port, selecting the orifice size, and establishing the piston area so that the impulse applied to the piston by the gas pressure will be of the correct value to produce the desired velocity. In the design, due allowance should be made for friction losses and for losses in piston energy resulting from operation of the unlocking device, but these losses will be neglected for purposes of this analysis. As pointed out at the beginning of this mathematical analysis, the factors controlling the flow of the powder gases through the gas port and orifice into the gas cylinder can not be handled in a simple manner by direct computation. However, it is possible to analyze the piston motion and determine the necessary impulse on the basis of a conservative assumption of how the pressure will rise in the gas cylinder in the prescncc of an orificc with a reasonable throttling action. When the gun is actually developed, the actual orifice size required to produce the necessary impulse can be determined by experimental firings; starting first with a very small orifice and gradually increasing its size until the desired action is obtained. As a starting point for the theoretical design, let the distance of the gas port be set so that the projectile will pass the port after a bore travel of 2.5 feet. As shown in fig. 3-19, this will occur at 0.00166 second. At this instant, the gun has acquired a recoil velocity of 6.4 feet per second (fig. 3-26 ). Since the piston moves in recoil with the gun, the piston has this initial velocity at the time the powder gas pressure starts to act on it. Fig. 3-30 shows a portion of the variation of the barrel pressure with respect to time and also shows a reasonable assumption of how the throttling effect of the orifice will affect the rise of pressure in the cylinder. The design must be arranged so that the pressure, acting between 0.00166 second and 0.005 sccond, will increase the piston velocity from its initial value of 6.4 feet per second to a final value of 91.7 feet per second. This piston diameter is of reasonable size (only slightly larger than the gun bore diameter of 0.79 inch). It should also be noted that the impulse produced by the gas cylinder (5.3 pound-seconds) is sufficiently close to the impulse assumed tentatively in paragraph 1 (5.13 pound-seconds) that it will not be necessary to revise fig. 3-21.